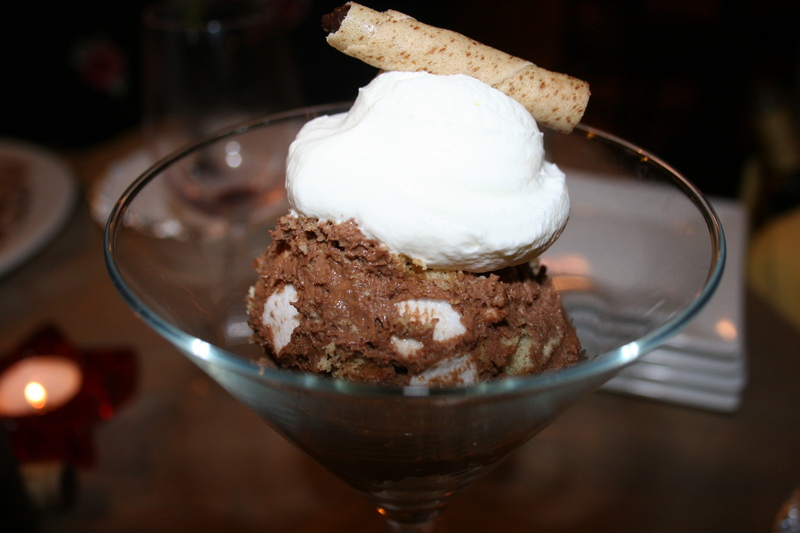 One of the newer dining spots on the Collingswood BYOB scene is That’s Amore. It occupies the spot at the corner of Haddon Ave. and Collings Ave. that previously housed the American Bistro and a host of other unsuccessful businesses. Interestingly, when looking for their website prior to our visit, I came across a “thread” on a dining board that had several posters engaged in a conversation in which they were claiming that That’s Amore personnel were using multiple screen names to post glowing reviews about their establishment. I am certainly not able to confirm or deny this but just seeing it talked about made me curious as to what type of experience awaited us on this Friday night in early December. 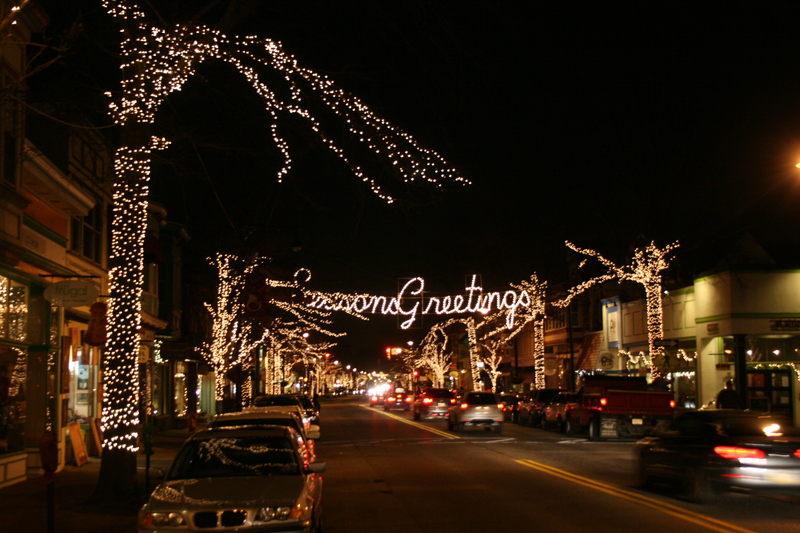 Collingswood itself was decked out in full Christmas display which made the mood even more festive than usual. We tend to forget sometimes how fortunate we are to have an area with so many good BYOBs available all in one charming town. 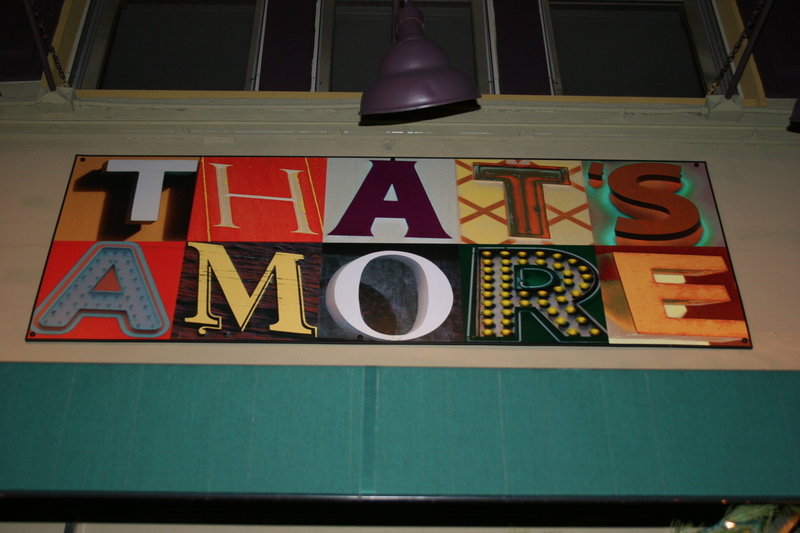 Right off the bat I can state that That’s Amore is colorful and eclectic. From the creative board outside featuring the evening “specials” to the decorative greens, and reds, peaches and gold wall colorings it gives a first impression of being a fun place to dine. But, what about the food? We will get to that. First, I need to tell you that it was just four of here on this night, Carol and Joe B., my wife Kathy, and myself. Here are the two wines we had with us. I brought a Super Tuscan, 2004 Castello Banfi, “Summus” a blend of Sangiovese, Cabernet Sauvignon and Syrah. It took some time in the glass to open up but once it did there was plenty of tasty red and black fruits creating an elegant balance and making for a very food-friendly wine. 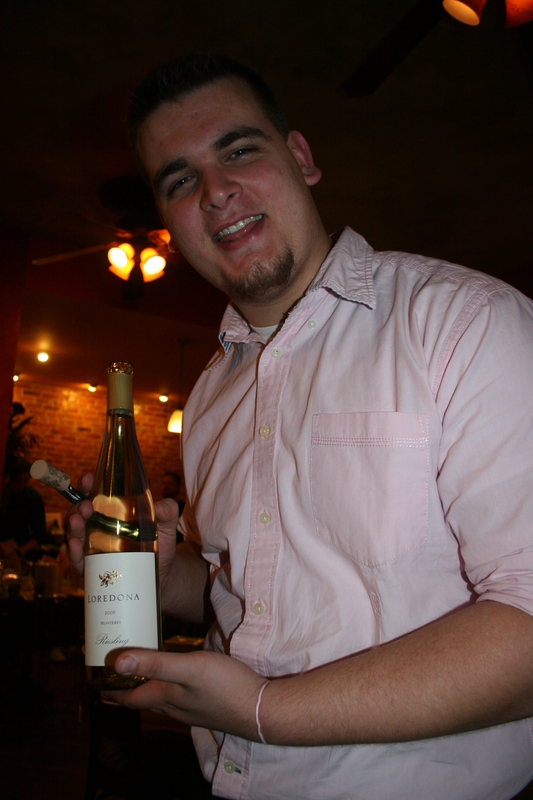 Joe B. had a 2008 Feudo Marino, Montepulciano d’Abruzzo, a fruity bright wine that pairs well with meats and red sauce. 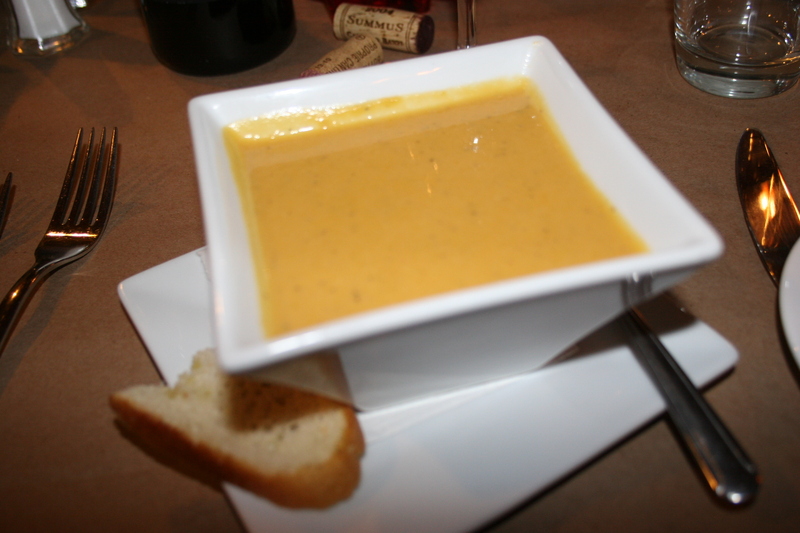 Joe and I had the soup du jour, the Butternut Squash and Apple Bisque, it arrived nice and hot and full of the unique combination of flavors. Both of us thoroughly enjoyed this soup. Kathy and Carol split the Eggplant Rollatini which looked scrumptious even to an anti-eggplant person, like myself. 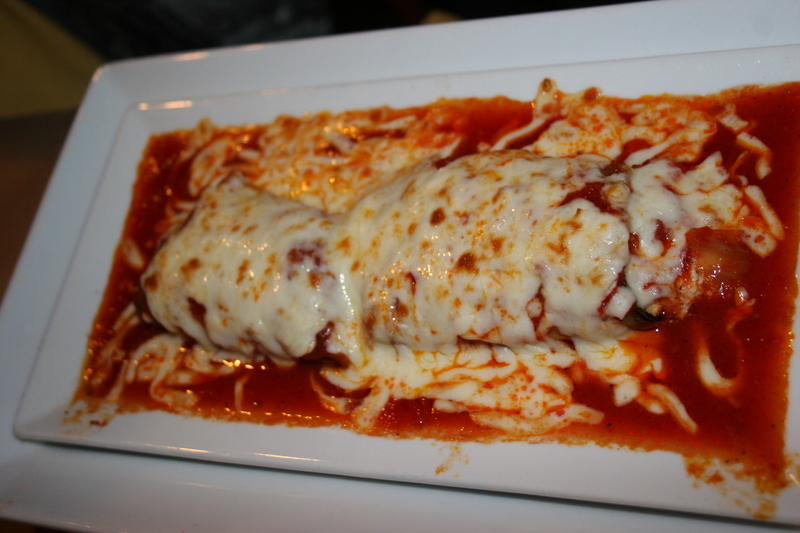 This one was thinly sliced and stuffed with fresh ricotta and mozzarella. It disappeared quickly between them; always a good sign. 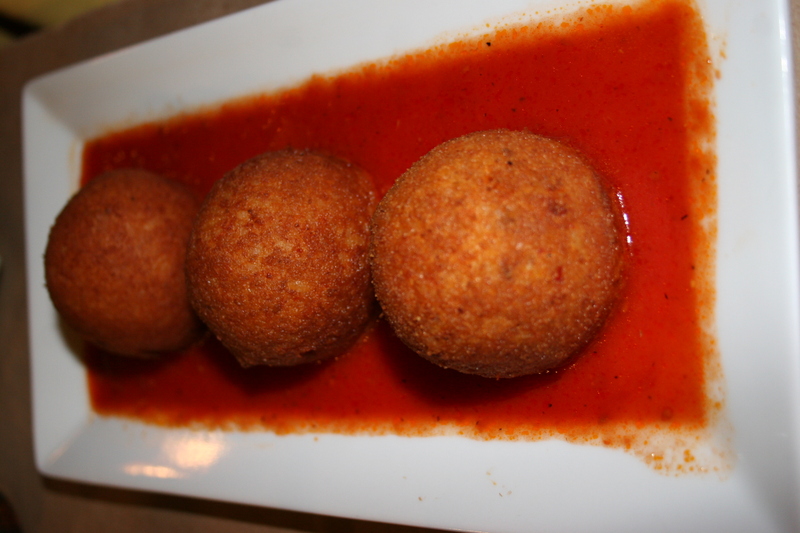 I couldn’t resist ordering the Arancini di Riso, three perfectly shaped rice balls stuffed with mozzarella cheese, lightly fried and served with a red dipping sauce. It’s the kinda dish your Mom would have said “would spoil your dinner”. It did not. It was very tasty but could have been filling. Now for the main course, our entrees. 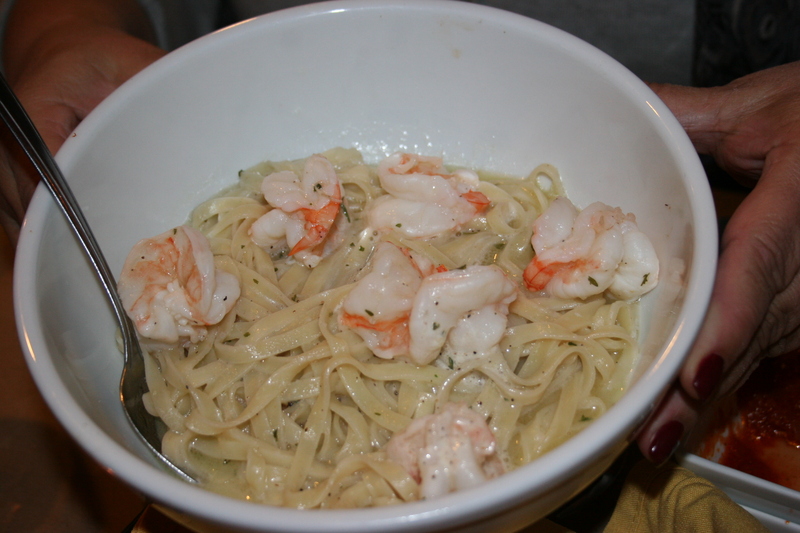 Carol had the Shrimp Scampi over house made linguine and Kathy went with the Chicken “Bella Gente” (named after a restaurant on Bleeker Street in The Village in New York). 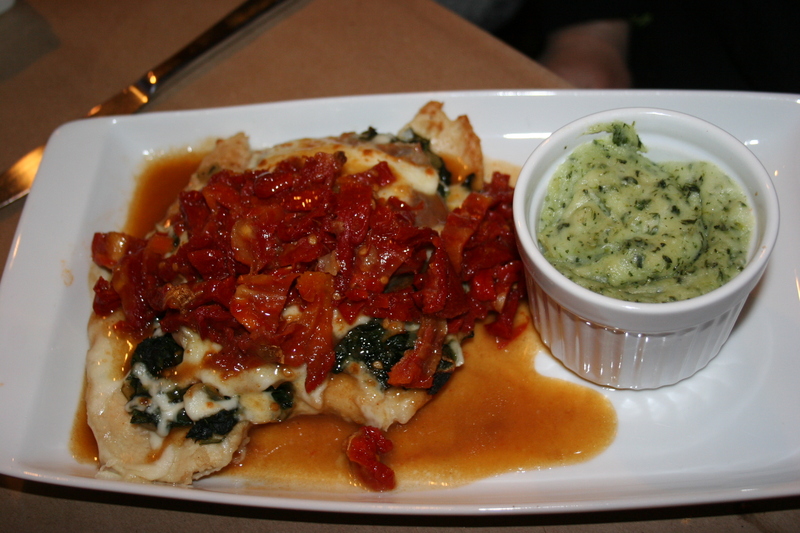 This one was tender chunks of chicken breast tossed with artichoke hearts, sun-dried tomatoes, sauteed garlic cloves and pepperoncini peppers in a white wine reduction. This was almost my choice and Kathy really liked it. 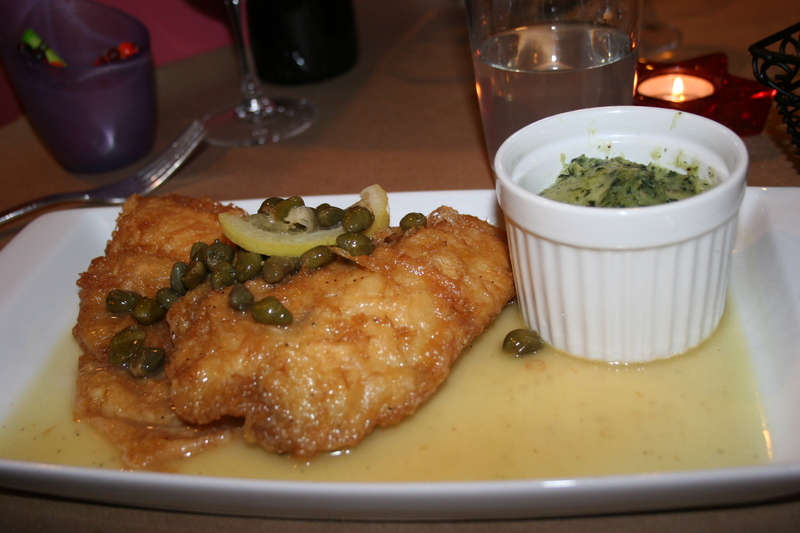 Joe ordered the Chicken and Capers which came with a cup of spinach flavored potatoes as did Kathy’s entree, also. They both liked this unusual way to serve spuds. 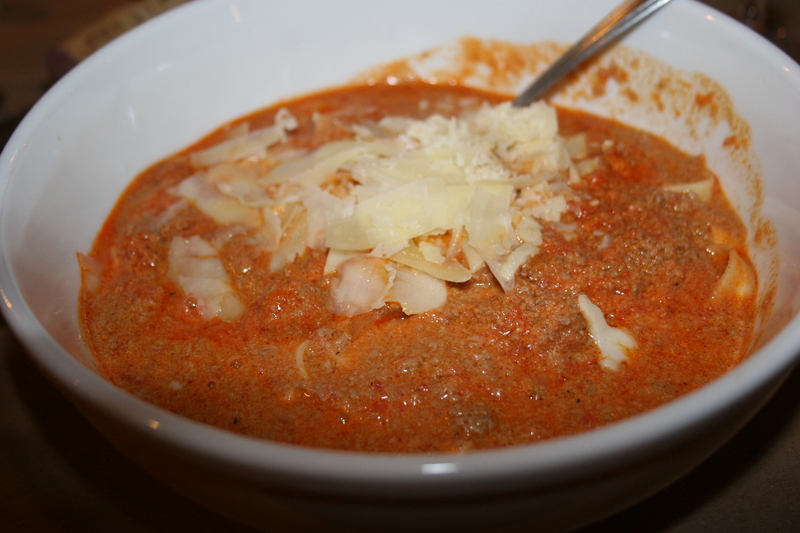 I wanted something to match the flavors of my wine and consequently chose the Fettuccine alla Bolognese, the pasta was perfect, the sauce was wonderful and I could not have been happier with my meal. 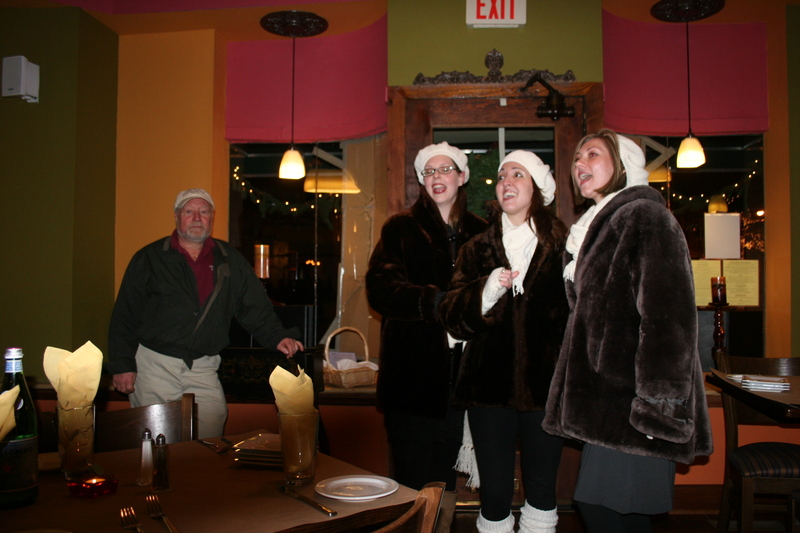 Just as we were finishing up our meal, the door opened and in strolled three female Carolers. They broke into a cute Caribbean Christmas song and followed that up with a more traditional, “We Wish You a Merry Christmas.” Great voices and a great interlude helping to make a great meal even more memorable. 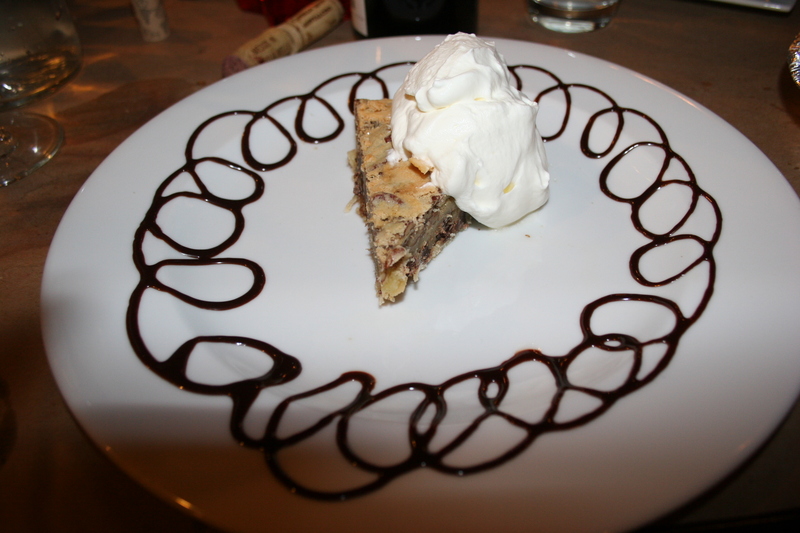 We topped off our meal with a couple of excellent desserts. Quite honestly, I don’t even know what they were but they looked good and tasted even better. Now that we have experienced That’s Amore I can contribute to the “are they writing their own reviews”? conversation. My guess is that the reviews are for real because the food and ambiance are deserving of lots of review “stars so, who cares, if they are, they are not lying. 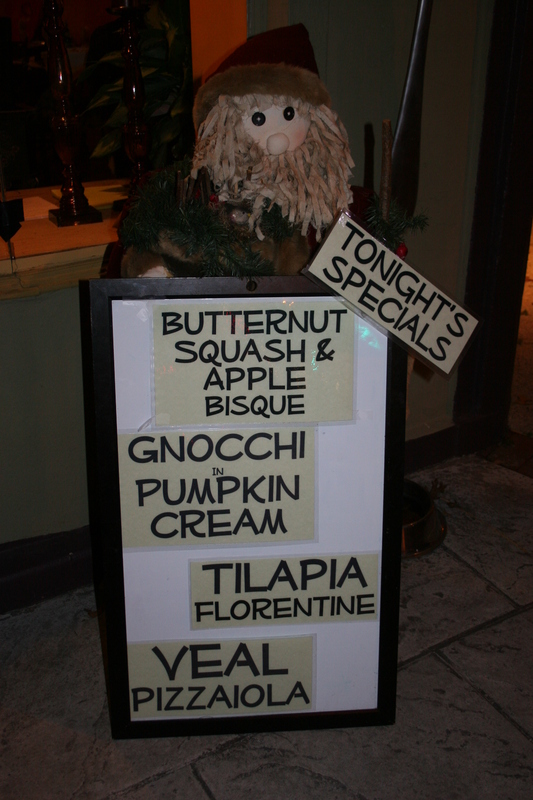 That’s Amore is a fine addition to the Collingswood BYOB team and, hopefully, we will be back there soon to enjoy this fun restaurant.